Sitting by the pool this weekend, I read an article in InStyle Magazine saying monograms are a trend. My mom would disagree with their trendiness and say they're always in fashion. Whatever your thoughts on monograms are, though, now is definitely a time to get them done. A lot of you spinsters out there may have been holding off on monogramming your sheets, towels, and/or shower curtains because you think "oh, it'll all go to waste if I get married and change my name." Well, girls, what about if you don't get married? What if the right guy doesn't come around for another 20 years or...ever? You might have harbored this deep love for embroidered initials all your life and for what? No, girl. If you like monograms, then get that done! (And if you live in Sumter, my mom can help you out...). This way, you can ease into the wearable monogram game without leaving your house. 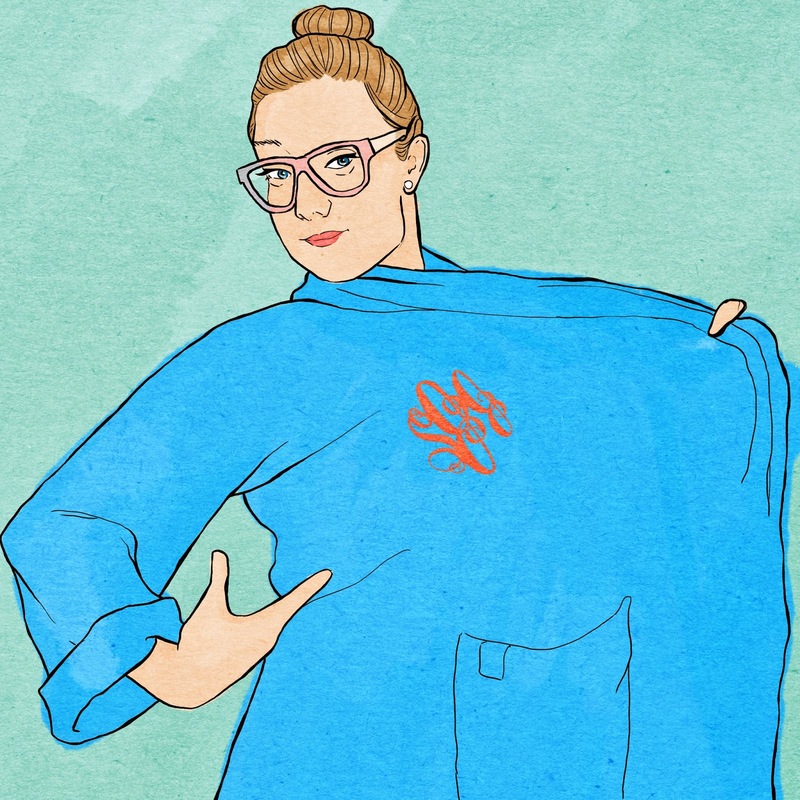 It's fairly common to buy a bathrobe with some sort of chest embroidery anyway, so this isn't a huge leap. This is also not a huge leap. Monogramming a bath towel has been done for...forever. It's great for remembering whose towel is whose. Even better, though, is monogramming a beach towel. That way no one can take it home from the beach or pool and think it's theirs. Some people have these machines that can do gigantic monograms (like...over 12 inches) and they look great on a shower curtain. I prefer a tonal monogram for this, but a pop color could work...if your'e still saying "pop color." If you live in a house with roommates and you sometimes do your laundry together, this is a great way to differentiate your sheets from one another's. Other than that, it just looks nice. Unless you have friends who also have the same initials as yours, this could be great for going to the beach or what have you. It's especially great if you're a tailgater and there are lots of things that are the same color...if not exactly the same. Now, if you happen to be reading this outside of the south or the east coast as a whole, and you're really jonesing for some monogramming, I have good news for you. Companies like Pottery Barn, L.L.Bean, and Land's End also offer limited monogramming services when you purchase something. So there you have it! You don't have to wait for your "final" last name to get something monogrammed. Just do it...if you want to.